Bayous Flood As Residents Scramble To Safety Whitewater cascaded through the gate of the Morganza Floodway in Louisiana Sunday, part of an emergency effort to save Baton Rouge and New Orleans from the rising Mississippi River. 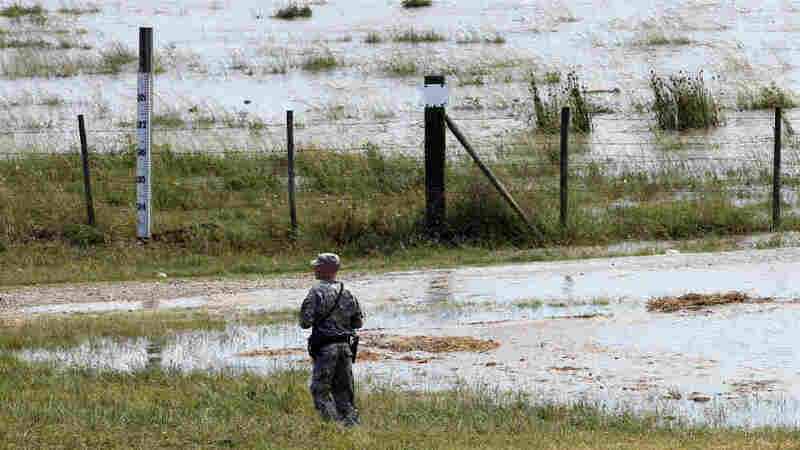 A member of the Louisiana National Guard stands guard as water diverted through the Morganza Spillway begins to fill a pasture in Morganza, La., on Saturday. Whitewater cascaded through the gate of the Morganza Floodway in Louisiana Sunday, part of an emergency effort to save Baton Rouge and New Orleans from the rising Mississippi River. The Army Corps of Engineers opened the first gate in the spillway on Saturday, diverting waters that will flood communities along the bayous that thousands call home. It's a historic moment; the Morganza Floodway has only been opened once before, in 1973. Army Corps of Engineers Col. Ed Fleming says it's the first time the Corps has ever operated three floodways at once on the Mississippi. In Missouri, the Corps blew holes in levees earlier this month to open the Birds Point Floodway. That lowered the river and protected Cairo, Ill., from flooding. The Corps has also opened the Bonnet Carre spillway of New Orleans and now the Morganza Floodway. Fleming says the Morganza is being opened to keep stress off the Mississippi levees that protect Baton Rouge, La., and New Orleans. "We'll take approximately 10,000 cubic feet per second off the top of the Mississippi River," he says. That's just a fraction of what the Morganza can handle. Even when the river crests in this area late next week, the Corps expects to open just a quarter of the floodgates. Fleming says the Corps will open the gates slowly — just one or two at a time — for a few reasons. One is to protect the spillway. "The water will come out of here pretty quickly," he says. "You don't want to scour the backside of this structure. From an environmental perspective, obviously there are lots of bear and other kinds of wildlife, and we want to make sure they have the opportunity to get to higher ground. "And last but most importantly, we want to make sure folks have the understanding that water's coming their way and they need to evacuate." About 60 miles south of the Morganza spillway, the people of Butte La Rose have gotten the message. At the Sacred Heart of Jesus Catholic Church, Teddy and Michelle Wyatt, along with their friend Clo Comeaux, were stacking pews from the church on a trailer. "We just volunteered to take everything out, to salvage what we could," they say. "The pews, the altar, the cross, you know, everything that was moveable." Down by the levee, a group of prisoners from the St. Martin Parish jail are working to fill sandbags to protect private and public buildings. They're being supervised by Clayton Landry, who is with the sheriff's department. He says it's been a busy week in Butte La Rose. "People are trying to move out, move their gear out of their homes and camps and save as much as they can," he says. "The sheriff hasn't announced a mandatory evacuation yet, but as soon as the water rises, they will announce it." That could come in the next few days. The Corps says it will take about three days for water in the floodway to reach the southern end, near Morgan City. Then it will begin to back up throughout the Atchafalaya Basin, backflooding bayou communities that are home to as many as 25,000 people. In these communities, people aren't happy about having to fight the water, but few question the Corps' decision to open the floodway. Corps officials are cautiously optimistic that with the Morganza, plus all the other levees and floodways in their toolbox, they'll be able to handle the 2011 flood and avert a catastrophe. But Corps Gen. Michael Walsh says it's important that hundreds of workers with the Corps and other agencies keep patrolling the levees to watch for warning signs. History, he says, shows the price of failure. "There was an 80-mile width of water covering five states from the '27 flood. So any type of failure or any type of concern from that regard in regards to underseeping and overtopping — we're gonna be on rapidly," he says. The Corps expects to keep the Morganza floodway open until the Mississippi crests in Louisiana and falls below a level that's a threat to levees in Baton Rouge and New Orleans. Unfortunately for people in the Atchafalaya Basin, that may be another three weeks.